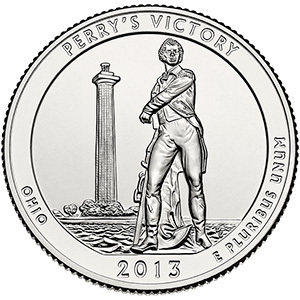 This 2019 Lowell National Historical Park in Massachusetts quarter is minted at the United States Mint at Denver and has never been placed into circulation. 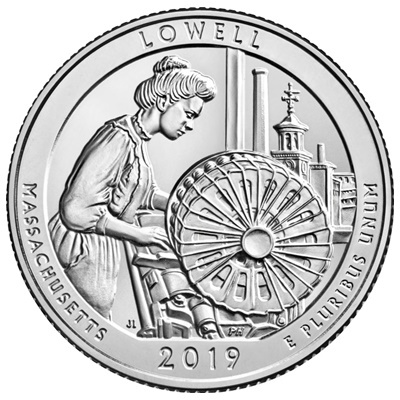 Lowell National Historical Park preserves and interprets the role of Lowell, MA, in the Industrial Revolution, archiving the history of the human story in addition to the industry processes and cultural environment of the time. The era was also defined in part by the “Mill Girls,” young women who were recruited to work in the mills where they earned cash wages and lived in supervised, company-owned boarding houses. They became an important voice for labour by advocating for better working conditions, supporting abolition, and embracing education. This design depicts a mill girl working at a power loom with its prominent circular bobbin battery. A view of Lowell, including the Boott Mill clock tower, is seen through the window.